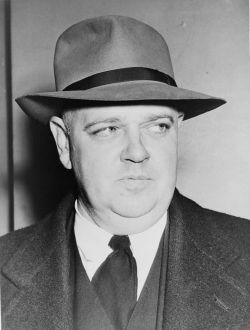 Whittaker Chambers (April 1, 1901 – July 9, 1961), born Jay Vivian Chambers and also known as David Whittaker, was an American writer and editor. A Communist party member and Soviet spy, he renounced communism and became an outspoken opponent. He is best known for his testimony about the perjury and espionage of Alger Hiss. The Chambers-Hiss saga was an important case in the 1950s "Red Scare." Chambers was largely vilified by members of the liberal and socialist intelligentsia, who defended Hiss against the charges. Some still believe that Chambers fabricated the story, but most now believe the charges against Hiss. He was born as Jay Vivian Chambers in Philadelphia, Pennsylvania, and spent much of his youth in Brooklyn and Lynbrook on Long Island, New York. His parents were Laha Whittaker and James Chambers, an illustrator and part of the New York-based "Decorative Designers" group, largely a group of students of Howard Pyle. He grew up in a household which he himself described as troubled by parental separation and the long-term presence of a mentally-ill grandmother. Chambers' father had deserted the family and sent them an allowance of $8 a week. Chambers' brother killed himself by drinking a quart of whiskey and putting his head inside an oven. After graduating from high school in 1919, he worked at a variety of jobs before enrolling in Columbia University in 1921. His fellow students included Louis Zukofsky, Lionel Trilling (who later made him a main character in his novel Middle of the Journey) and Meyer Schapiro. In the intellectual environment of Columbia he gained friends and respect. His professors and fellow students found him a talented writer and believed he might become a major poet or novelist. Historian Kathryn Olmsted has described him as being, at this time in his life, "brilliant, disturbed, idealistic, dysfunctional." Early in his sophomore year, Chambers wrote a play entitled "A Play for Puppets" for Columbia's literary magazine The Morningside, which he edited. The work was deemed blasphemous by many students and administrators, and the controversy spread to New York City newspapers. Disheartened over the furor, Chambers decided to leave the college in 1925. In 1924, Chambers read Vladimir I. Lenin's Soviets at Work and was deeply affected by it. He now saw the dysfunctional nature of his family, he would write, as "in miniature the whole crisis of the middle class"; a malaise from which Communism promised liberation. Chambers's biographer Sam Tanenhaus wrote that Lenin's authoritarianism was "precisely what attracts Chambers… He had at last found his church." In 1925, Chambers joined the Communist Party of the United States (CPUSA) and wrote and edited for Communist periodicals, including The Daily Worker and The New Masses. Chambers combined his literary talents with his devotion to Communism, writing four short stories in 1931 about proletarian hardship and revolt. One of these was Can You Make Out Their Voices?, which has been described by critics as one of the best pieces of fiction to come out of the American Communist movement. This story was later published as the play Can You Hear Their Voices? (see Writings by Chambers, below), and staged across America and in many other countries. His other works during this time include the English translation of Felix Salten's 1923 novel Bambi, A Life in the Woods. In 1930 or 1931, Chambers married Esther Shemitz (1900-1986), a young artist and fellow Communist whom he had encountered at a party-organized textile strike in 1926; the couple would eventually have a son and a daughter. Henry Collins, employed at the National Recovery Administration and later the Agricultural Adjustment Administration (AAA). Lee Pressman, assistant general counsel of the AAA. Alger Hiss, attorney for the AAA and the Nye Committee; he moved to the Department of State in 1936, where he became an increasingly prominent figure. John Abt, chief of Litigation for the AAA from 1933 to 1935, assistant general counsel of the Works Progress Administration in 1935, chief counsel on Senator Robert M. La Follette, Jr.'s LaFollette Committee from 1936 to 1937 and special assistant to the United States Attorney General, 1937 and 1938. Charles Kramer, employed at the Department of Labor National Labor Relations Board (NLRB). Nathan Witt, employed at the AAA; later moved to the NLRB. George Silverman, employed at the Railroad Retirement Board; later worked with the Federal Coordinator of Transport, the United States Tariff Commission and the Labor Advisory Board of the National Recovery Administration. Marion Bachrach, sister of John Abt; office manager to Representative John Bernard of the Minnesota Farmer-Labor Party. John Herrmann, author; assistant to Harold Ware; employed at the AAA; courier and document photographer for the Ware group; introduced Chambers to Hiss. Nathaniel Weyl, author; would later defect from Communism himself and give evidence against party members. Donald Hiss, brother to Alger Hiss; employed at the Department of State. Victor Perlo, chief of the Aviation Section of the War Production Board, later joined the Office of Price Administration Department of Commerce and the Division of Monetary Research at the Department of Treasury. Apart from Marion Bachrach, these people were all members of Franklin D. Roosevelt's New Deal administration. Chambers worked in Washington as an organizer among Communists in the city and as a courier between New York and Washington for stolen documents which were delivered to Boris Bykov, the GRU Illegal Resident (a Soviet spymaster who resides in the U.S. undercover, rather than as an embassy employee). Noel Field, employed at the Department of State. Harold Glasser, Assistant Director, Division of Monetary Research, United States Department of the Treasury. Ward Pigman, employed at the National Bureau of Standards; Labor and Public Welfare Committee. Vincent Reno, a mathematician at the U.S. Army Aberdeen Proving Ground. Julian Wadleigh, economist with the Department of Agriculture and later the Trade Agreements section of the United States Department of State. Harry Dexter White, Director of the Division of Monetary Research at the Secretary of the Treasury. Chambers carried on his espionage activities from 1932 until 1937 or 1938, but his faith in Communism was waning. He became increasingly disturbed by Joseph Stalin's Great Purge, which began about 1936. He was also fearful for his own life, having noted the murder in Switzerland of Ignatz Reiss, a high-ranking Soviet spy who had broken with Stalin, and the disappearance of his friend and fellow spy Juliet Poyntz in the United States. Poyntz had vanished in 1937, shortly after she had visited Moscow and returned disillusioned with the Communist cause due to the Stalinist Purges. In his last years as a spy for the Soviets, Chambers ignored several orders that he travel to Moscow, worried that he might be "purged." He also started holding back some of the documents he collected from his sources. He planned to use these, along with several rolls of microfilm photographs of documents, as a "life preserver" that would convince the Soviets that they could not afford to kill him. In 1938, Chambers broke with Communism and took his family into hiding, storing the "life preserver" at the home of his nephew and his parents. Initially he had no plans for giving information on his espionage activities to the U.S. government. His espionage contacts were his friends, and he had no desire to inform on them. Although he broke with the Communist party in 1937 or 1938 (his later accounts would vary) the 1939 Hitler-Stalin non-aggression pact was reportedly the final straw in turning Chambers against the Soviet Union. He saw the pact as a betrayal of Communist values, and was also afraid that the information he had been supplying to the Soviets would be made available to Nazi Germany. In September of 1939, at the urging of anti-Communist, Russian-born journalist, Isaac Don Levine, Chambers and Levine met with Assistant Secretary of State Adolf Berle at Berle's home. Chambers was afraid that he would be found out by Soviet agents who had penetrated the government if he were to meet at the State Department. Levine had told Chambers that Walter Krivitsky had begun informing to American and British authorities concerning Soviet agents who held posts in both governments. Chambers agreed to reveal what he knew on the condition of immunity from prosecution. At the meeting, Chambers named 18 current and former government employees as spies or Communist sympathizers. Many of the names he mentioned held relatively minor posts or were already widely suspected of being Communists. Other names were more significant and surprising, however: Alger Hiss, Donald Hiss and Laurence Duggan, all respected midlevel officials in the State Department; Lauchlin Currie, a special assistant to Franklin Roosevelt. Another member of the ring was said to be working on a top secret bombsight project at the Aberdeen Proving Grounds. There was little immediate result to Chambers's confession. He chose not to produce his envelope of evidence at this time, and Berle thought his information was tentative, unclear and uncorroborated. Berle took the information to the White House, but the President dismissed it, apparently with little objection from Berle. Berle notified the FBI of Chambers's information in March of 1940. In February of 1941 the Soviet defector Walter Krivitsky was found dead in his hotel room. The death was ruled a suicide, but it was widely speculated that Krivitsky had been killed by Soviet intelligence. Worried that the Soviets might try to kill Chambers too, Berle again told the FBI about his interview with Chambers, but the FBI took no immediate action. Although Chambers was interviewed by the FBI in May of 1942 and June of 1945, it wasn't until November 1945, when Elizabeth Bentley defected and corroborated much of Chambers' story, that the FBI began to take him seriously. Meanwhile, after living in hiding for a year, Chambers had joined the staff of TIME Magazine in 1939. Starting at the back of the magazine, reviewing books and film with James Agee, he eventually rose to the rank of a senior editor. While at TIME, Chambers became known as a staunch anti-Communist, sometimes enraging his writers with the changes he made to their stories. Some colleagues, led by Richard Lauterbach and Theodore White, tried to have publisher Henry Luce remove him, but Luce was also a staunch anti-Communist who respected Chambers' skill as a writer and editor. By early 1948, Chambers had become one of the best known writer-editors at TIME. First came his scathing commentary "The Ghosts on the Roof" (March 5, 1945) on the Yalta Conference (where, ironically, Hiss was a major participant). His cover-story essays profiled Marian Anderson, Arnold Toynbee, Rebecca West, and Reinhold Niebuhr. The cover story on Marion Anderson (December 30, 1947) proved so popular that the magazine broke its rule of non-attribution in response to readers' letters: "Most TIME cover stories are written and edited by the regular staffs of the section in which they appear. Certain cover stories, that present special difficulties or call for a special literary skill, are written by Senior Editor Whittaker Chambers." Chambers was at the height of his career when the Hiss case broke later that year. It was during this period after his defection that Chambers and his family became members of Pipe Creek Meeting of the Religious Society of Friends, or Quakers, about 12 miles from his Maryland farm. On August 3, 1948, Chambers was called to testify before the House Un-American Activities Committee (HUAC). Here he gave the names of individuals he said were part of the underground "Ware group" in the late 1930s, including Alger Hiss. He thus once again named Hiss as a member of the Communist Party, but didn't yet make any accusations of espionage. In subsequent HUAC sessions, Hiss testified and initially denied that he knew anyone by the name of Chambers, but on seeing him in person (and after it became clear that Chambers knew details about Hiss's life), said that he had known Chambers under the name "George Crosley." Chambers had published previously using the pseudonym George Crosley. Hiss denied that he had ever been a Communist, however. Since Chambers still presented no evidence, the committee had initially been inclined to take the word of Hiss on the matter. However, committee member Richard Nixon received secret information from the FBI which had led him to pursue the issue. When it issued its report, HUAC described Hiss's testimony as "vague and evasive." The country quickly became divided over the Hiss-Chambers issue. President Truman, not pleased with the allegation that the man who had presided over the United Nations Charter Conference was a Communist, dismissed the case as a "red herring." In the atmosphere of increasing anti-communism that would be later be termed McCarthyism, many conservatives viewed the Hiss case as emblematic of what they saw as Democrats' laxity towards the danger of communist infiltration and influence in the State Department. Many liberals, in turn, saw the Hiss case as part of the desperation of the Republican Party to regain the office of president, having been out of power for 16 years. Democrats pointed to Truman's anti-communist foreign policy exemplified by his Truman Doctrine to show he was as anti-communist as the Republicans, if not more so. Truman also enacted Executive Order 9835, which initiated a program of loyalty reviews for federal employees in 1947. Hiss filed a $75,000 libel suit against Chambers on October 8, 1948. Under pressure from Hiss's lawyers, Chambers finally retrieved his envelope of evidence and presented it to the HUAC after they subpoenaed them. It contained four notes in Alger Hiss's handwriting, 65 typewritten copies of State Department documents and five strips of microfilm, some of which contained photographs of State Department documents. The press came to call these the "Pumpkin Papers" referring to the fact that Chambers had briefly hidden the microfilm in a hollowed out pumpkin. These documents indicated that Hiss knew Chambers long after mid-1936, when Hiss said he had last seen "Crosley," and also that Hiss had engaged in espionage with Chambers. Chambers explained his delay in producing this evidence as an effort to spare an old friend from more trouble than necessary. Until October, 1948, Chambers had repeatedly stated that Hiss had not engaged in espionage, even when he testified under oath. Chambers' was forced to testify at the Hiss trials that he had committed perjury several times, which served to impugn Chambers's credibility. In 1975, the Justice Department released the contents of the "Pumpkin Papers," which showed that of the five rolls of microfilm that Richard Nixon had described as evidence of the "most serious series of treasonable activities … in the history of America," one roll was blank due to overexposure and the information on two other rolls contained faintly legible copies of Navy Dept. documents relating to such subjects as life rafts, parachutes and fire extinguishers, information which was obtainable at the time from the open shelves at the Bureau of Standards,and two other rolls are photographs of State Department documents which were introduced as evidence at the two Hiss trials in 1949 and 1950. Hiss could not be tried for espionage at this time, because the evidence indicated the offense had occurred more than ten years prior to that time, and the statute of limitations for espionage was five years. Instead, Hiss was indicted for two counts of perjury relating to testimony he had given before a federal grand jury the previous December. There he had denied giving any documents to Whittaker Chambers, and testified he hadn't seen Chambers after mid-1936. Hiss was tried twice for perjury. The first trial, in June of 1949, ended with the jury deadlocked eight to four for conviction. In addition to Chambers's testimony, a government expert testified that other papers typed on a typewriter belonging to the Hiss family matched the secret papers produced by Chambers. An impressive array of character witnesses appeared on behalf of Hiss: two U. S. Supreme Court justices, Felix Frankfurter and Stanley Reed, former Democratic presidential nominee John W. Davis and future Democratic presidential nominee Adlai Stevenson. Chambers, on the other hand, was attacked by Hiss's attorneys as "an enemy of the Republic, a blasphemer of Christ, a disbeliever in God, with no respect for matrimony or motherhood." In the second trial, Hiss's defense produced a psychiatrist who characterized Chambers as a "psychopathic personality" and "a pathological liar." The second trial ended in January of 1950 with Hiss found guilty on both counts of perjury. He was sentenced to five years in prison. Chambers had resigned from TIME in December 1948. After the trial, William F. Buckley, Jr. initiated the magazine National Review and Chambers briefly worked there as senior editor (perhaps most famously writing a scathing review of Ayn Rand's Atlas Shrugged). He also wrote for Fortune and Life magazines. In 1952, Chambers's book Witness was published to widespread acclaim. The book was a combination of autobiography, an account of his role in the Hiss case and a warning about the dangers of Communism and liberalism. Arthur Schlesinger, Jr. called it one of the greatest of all American autobiographies, and Ronald Reagan credited the book as the inspiration behind his conversion from a New Deal Democrat to a conservative Republican. Witness was a bestseller for more than a year and helped pay off Chambers' legal debts. Chambers died of a heart attack on July 9, 1961 at his 300-acre farm in Westminster, Maryland. He had suffered from angina since the age of 38 and had had several heart attacks previously. His second book, Cold Friday, was published posthumously in 1964 with the help of Duncan Norton Taylor. The book predicted that the fall of Communism would start in the satellite states surrounding the Soviet Union in Eastern Europe. 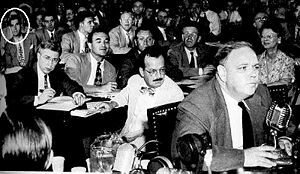 At Chambers's first testimony before HUAC, he implicated Harry Dexter White as well as Alger Hiss as a covert member of the Communist party. White died shortly thereafter, so the case didn't receive the attention that the charges against Hiss did. Transcripts of coded Soviet messages decrypted through the Venona project, revealed in 1995, have added evidence regarding White's covert involvement with Communists and Soviet intelligence. Venona evidence regarding Alger Hiss is less conclusive, though it was sufficient for a bipartisan Commission on Government Secrecy, headed by Senator Daniel Patrick Moynihan to conclude "The complicity of Alger Hiss of the State Department seems settled. As does that of Harry Dexter White of the Treasury Department." Chambers's book Witness is on the reading lists of the Heritage Foundation, The Weekly Standard, and the Russell Kirk Center. He is regularly cited by conservative writers such as Heritage's president Edwin Feulner. In 1984, President Ronald Reagan posthumously awarded Chambers the Presidential Medal of Freedom, for his contribution to "the century's epic struggle between freedom and totalitarianism." In 1988, Interior Secretary Donald P. Hodel granted national landmark status to the Pipe Creek Farm. In 2001, members of the George W. Bush Administration held a private ceremony to commemorate the hundredth anniversary of Chambers's birth. Speakers included William F. Buckley, Jr. In 2007, John Chambers revealed that a library containing his father's papers should open in 2008 on the Chambers farm in Maryland. He indicated that the facility will be available to all scholars and that a separate library, rather than one within an established university, is needed to guarantee open access. Chambers, Whittaker (1932). Can You Hear Their Voices? International Pamphlets. Chambers, Whittaker (1952 (1984, 1997)). Witness. Random House (republished by Regnery). ISBN 0895265710. Luce, Clare Boothe (ed.) (1952). Saints for Now. (includes an article by Whittaker Chambers). Ignatius Press. ISBN 0898704766. Chambers, Whittaker (1964). Cold Friday. Random House. ISBN 0394419693. Whittaker Chambers, Witness.The Augustine Club at Columbia University, Foreword in the Form of a Letter to My Children. Retrieved November 5, 2008. Chambers, Whittaker (1987). Odyssey of a Friend: Letters to William F. Buckley Jr. 1954-1961. Regnery Publishing, Inc. ISBN 0895265672. Chambers, Whittaker (1997). Notes from the Underground: The Whittaker Chambers/Ralph de Toledano Letters, 1949-1960. Regnery Publishing, Inc. ISBN 0895264250. ↑ He assumed his mother's maiden name, "Whittaker," in the 1920s. ↑ TIME'S People and TIME'S Children, March 8, 1948. TIME. .
↑ Cliff Kincaid, Whittaker Chambers Library To Open. 2007, . Retrieved November 5, 2008. Cook, Fred J. (1958). The Unfinished Story of Alger Hiss. William Morrow & Company. ISBN 1131853520. Cooke, Alistair (1950). A Generation on Trial: USA v. Alger Hiss. Greenwood Press. ISBN 0313-23373X. Gwynn, Beatrice (1993). Whittaker Chambers: The Discrepancy in the Evidence of the Typewriter. Mazzard Publishers. ISBN 0951873814. Hiss, Alger (1957). In the Court of Public Opinion. Harper Collins. ISBN 0060902930. Hiss, Alger (1989). Recollections of a Life. Little Brown & Co. ISBN 1559700246. Hiss, Tony (1977). Laughing last: Alger Hiss. Houghton Mifflin. ISBN 039524899X. Hiss, Tony (1999). The View from Alger's Window: A Son's Memoir. Alfred E. Knopf. ISBN 037540127X. Kempton, Murray (1955) 2003 reprint. Part of Our Time: Some Ruins and Monuments of the Thirties. NYRB Classics. ISBN 1-59017-087-3. Levitt, Morton and Michael Levitt, (1979). Tissue of Lies: Nixon vs. Hiss. Random House. ISBN 0517371340. Olmsted, Kathryn S. (2002). Red Spy Queen: A Biography of Elizabeth Bentley. University of North Carolina Press. ISBN 0807827398. Ruddy, T. Michael (2004). The Alger Hiss Espionage Case. Wadsworth Publishing. ISBN 0155085603. Seth, Ronald (1968). The Sleeping Truth: The Hiss-Chambers Affair Reappraised. Frewin. ISBN 0090868900. Smith, John Chabot (1976). Alger Hiss, The True Story. Holt, Rinehart and Winston. ISBN 0030137764. Swan, Patrick, Ed. (2003). Alger Hiss, Whittaker Chambers, and the Schism in the American Soul. ISI Books. ISBN 1882926919. Tanenhaus, Sam (2007). An Un-American Life: The Case of Whittaker Chambers. Old Street Publishing (UK). ISBN 978-1905847075. Theoharis, Athan, Ed. (1982). Beyond the Hiss Case: The FBI, Congress, and the Cold War. Temple University Press. ISBN 087722241X. Weinstein, Allen (1978). Perjury: The Hiss-Chambers Case. Random House. ISBN 067977338X. White, G. Edward (2005). Alger Hiss's Looking-Glass Wars: The Covert Life of a Soviet Spy. Oxford University Press. ISBN 0195182553. Worth, Esme J. (1993). Whittaker Chambers: The Secret Confession. Mazzard Publishers. ISBN 0951873806. Zeligs, Meyer A. (1967). Friendship and Fratricide: An Analysis of Whittaker Chambers and Alger Hiss. New York: Viking Press. ISBN 1199499870. Haynes, John Earl and Harvey Klehr. (2000). Venona: Decoding Soviet Espionage in America. Yale University Press. ISBN 0300084625. Andrew, Christopher and Vasili Mitrokhin. (2000). The Sword and the Shield: The Mitrokhin Archive and the Secret History of the KGB. Basic Books. ISBN 0465003125. Weinstein, Allen and Alexander Vassiliev. (2000). The Haunted Wood: Soviet Espionage in America—The Stalin Era. Modern Library. ISBN 0375755365. Schecter, Jerrold and Leona Schecter. (2003). Sacred Secrets: How Soviet Intelligence Operations Changed American History. Potomac Books. ISBN 1574885227. Haynes, John Earl and Harvey Klehr. (2003). In Denial: Historians, Communism, and Espionage. Encounter Books. ISBN 1893554724. Buckley, William F. (1999). The Redhunter: A Novel Based on the Life of Senator Joe McCarthy. Little, Brown. ISBN 0316115894. Oeste, Bob (1996). Last Pumpkin Paper (novel). Random House. ISBN 0679448373. Trilling, Lionel. (2002). The Middle of the Journey. New York Review of Books. ISBN 1590170156. This page was last modified on 2 May 2013, at 17:07.